Specialization is a process in which an entity is divided into sub-entities. You can think of it as a reverse process of generalization, in generalization two entities combine together to form a new higher level entity. Specialization is a top-down process. The idea behind Specialization is to find the subsets of entities that have few distinguish attributes. For example – Consider an entity employee which can be further classified as sub-entities Technician, Engineer & Accountant because these sub entities have some distinguish attributes. 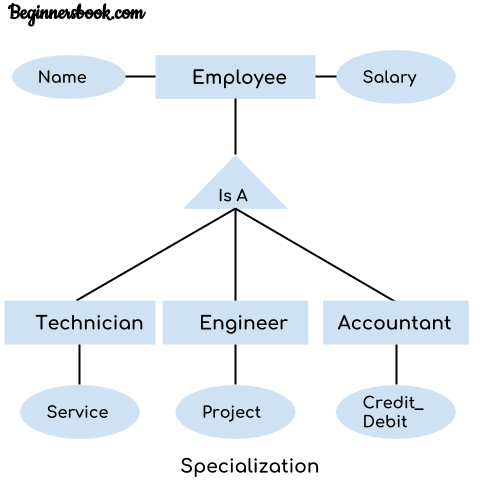 In the above diagram, we can see that we have a higher level entity “Employee” which we have divided in sub entities “Technician”, “Engineer” & “Accountant”. All of these are just an employee of a company, however their role is completely different and they have few different attributes. Just for the example, I have shown that Technician handles service requests, Engineer works on a project and Accountant handles the credit & debit details. All of these three employee types have few attributes common such as name & salary which we had left associated with the parent entity “Employee” as shown in the above diagram.